Heat and electricity are vital parts of our everyday lives, and it should be everyone’s right to access these services without any barriers. However with rising costs and tariffs, and a lack of knowledge about what can be done to save money and energy, consumers can often be paying far too much for their energy. 28% of private rented homes in Scotland are in fuel poverty, and 12% of Scottish homes rely on electricity for heating. A vast number of homes can’t access, or make use of, gas, despite it being cheaper. 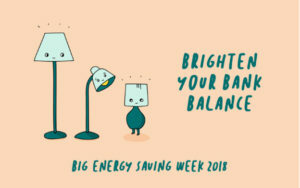 Big Energy Saving Week (BESW), encourages people to focus their energy (no pun intended!) on switching suppliers, changing habits around the house, and seeking the necessary advice to reduce bills and be more energy-efficient. The campaign – a collaboration between Citizens Advice, Home Energy Scotland, and the Department of Business, Energy and Industrial Strategy – also highlights what support is available, such as grants and discounts. BESW has proven to be a success in the past. Customers saved around 1 million pounds last year, and 9 in 10 consumers felt more confident in dealing with energy suppliers after attending a BESW event. People often pay too much for their bills, and reports show that consumers can be misled by their own supplier when switching tariffs, even paying around the same price as before. People don’t realise they can get a better deal elsewhere, and instead remain with the same supplier for years (34% haven’t switched supplier). Many people also don’t realise they have access to benefits and discounts which could help save money. In fact, over £20bn in benefits and tax credits go unclaimed in the UK. It’s worth checking out what you might be eligible for through Citizens Advice & Rights Fife. Sometimes it can be daunting to make that leap to another provider, but as mentioned above, many people miss out on better deals by sticking with what they’ve got. To make it much easier to decide, Citizens Advice provide a full market comparison tool that is free, independent and gives a customer service rating out of 5 stars. It’s also worth visiting energyswitchguarantee.com and checking which suppliers have signed up. It ensures switching is completed in 21 days. You can save a lot of money by being more energy-efficient around the house. By making small changes like switching off the light when leaving a room, or turning devices off standby, you can save over £80 a year. Properly insulating your home can save a quarter of heat and reduce your carbon footprint, as well as leading to savings of over £100. Our Cosy Kingdom energy advisors can also offer you free and impartial advice, do an energy comparison for you, and help you switch. We can also give tips and advice on reducing your energy use at home, and making your home more energy efficient, and refer you on to Citizens Advice & Rights Fife for benefit checks and monetary advice. Book a home visit here.